Castles and churches are the main attraction in Fyn (Funen). Egeskov Castle is a superb moated Renaissance castle, which is fairytale in every detail. Other castles in the area include Nyborg (seat of the former National Assembly) and Valdemar, which houses a naval museum. There are also a number of beautiful beaches, particularly on the southern islands of Langeland, Tåsinge and Ærø. Odense has a festival every July and August celebrating the life and works of Hans Christian Andersen. Visitors can see the Hans Christian Andersen Museum and his childhood home. Other museums include a major railway museum and Fyn Village, a major cultural center. 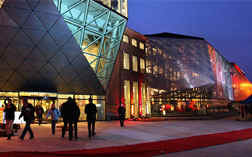 Also in Odense is the Brandts Klaedefabrik, a major cultural center. Fyn s newest attraction, Naturama, opened in 2005, incorporating three levels of multimedia natural history displays.